Harold Porter Garden is one of the country’s national botanical gardens. It’s only about an hour’s drive from Cape Town, just off Clarence Drive at Betty’s Bay, and well worth the drive. It’s also where sea, mountains and fynbos meet. 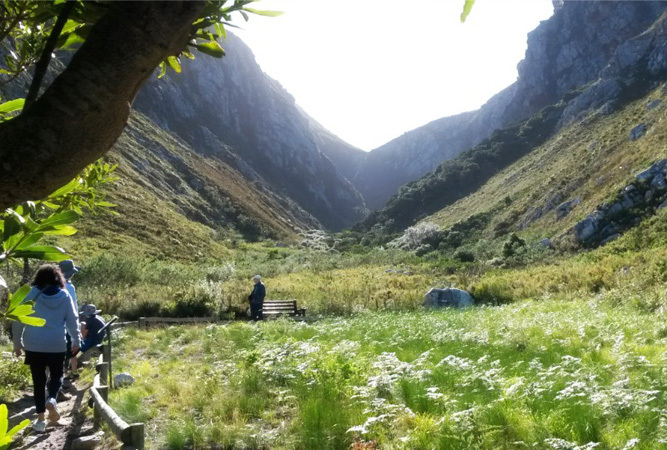 The garden, which rests on the slope of the mountains within the Kogelberg Biosphere reserve, overlooks the ocean from almost every vantage point, and the gardens are awash with fynbos, irises, daisies and orchids, including the famous red disa. There is nothing more magical than the Cape in autumn. The permanent ambient light means that everything is more striking. You don’t need sunglasses, for a start, the constant heat haze of summer gives way to a delicate blue sky, and vivid vistas, and you no longer gasp for shade but are grateful for the gentle presence of the sun. There are a number of walking trails within Harold Porter but Leopard’s Kloof is particularly beautiful, and a relatively easy (only 1.5 km each way) morning walk that, I would imagine, would also be a great summer walk as most of it is through forest under towering yellowwood trees, alongside a series of tumultuous waterfalls (at this time of year, anyway) – the Leopard’s kloof stream cascades down various levels of the kloof. Harold Porter is also reasonably priced (almost half the going Kirstenbosch rate) and free to annual Botanical Society members. The gardens are incredibly scenic. Mountains in the background, sea on the opposite side. And it was not difficult to find our way along the edge of the Circular Route (the main path through the cultivated part of the Garden) to the Round Bridge, a gift to the garden from Susan Anne Pryers, so that her memory lives on in the garden. From the sign board indicating the trails and walks in the garden, we took a right and began the Leopard’s Kloof Trail. 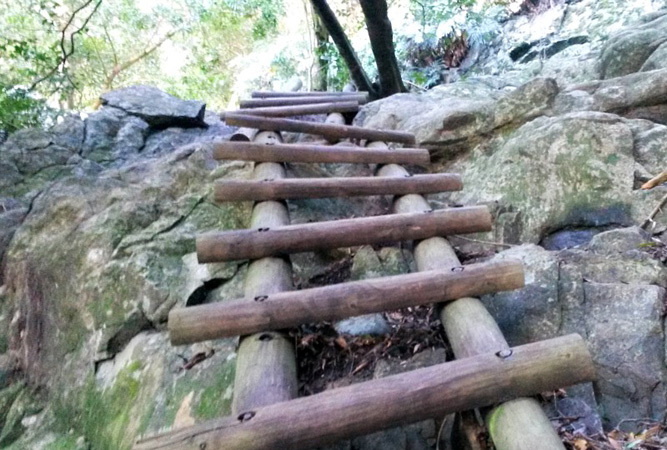 Although the hike calls for a reasonable level of fitness, most people would easily manage this walk, unless wooden ladders and a fair incline are difficult for you. Much of the walk is stepped and the path easy to find and follow. Turn around at any stage and views of the sea clearly open up the higher you go. At the same time, the kloof narrows, so that eventually there are mountains on either side of you and you find yourself in the shade of the kloof’s forest. A couple of stream crossings can get tricky, if you are not sure of yourself and because a couple of the boulders are apt to wobble. During summer I would imagine these crossings are a lot easier, but with rain, the stream flows a lot more rapidly. It’s a real pity that no swimming is allowed, as the river pools repeatedly, as you head up the kloof, some of the climbs made a lot easier with big wooden ladders. The ladder part of the path is another gift from a garden enthusiast – Selina’s gift – from one who cherished the flowers, birds and streams of this valley. You are invited to share the peace of the kloof with her. Leopard’s kloof trail and the two gifts to the garden are a sharp reminder of the beauty we have available to us in so many ways in South Africa, and how lucky we are. The final waterfall is a photo moment in the making. If you’re heading into the kloof, you will need to buy a permit and pay a key deposit at the entrance to the garden (there is a gate leading into the kloof that remains closed to other visitors). There are limited numbers allowed into the kloof, but I would imagine this trail gets busy during summer; it was fairly busy even in autumn. is not great for those with a fear of heights, but it isn’t difficult. It does involve a steep walk up a path that zigs and zags its way up the mountain until it reaches the border of the garden. You can’t go any further without a permit from Cape Nature. This walk, like Leopard Kloof, returns the same way. is named for the blousterretjie or Nivenia stokoei. 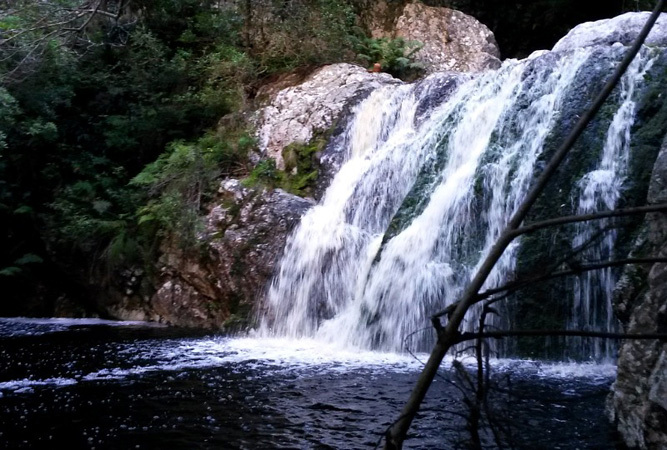 It is a short and easy walk from the Attwell Bridge off the main route to Leopard’s Kloof, ending at Nerine Dell and the Harold Porter memorial stone. is really the main path through the cultivated portion of the garden and is only about 700 metres long. It only takes about 15 minutes to walk, but because this is the themed part of the garden, one is apt to wander and take a lot longer, distracted by the wealth of information on boards en route. is wheelchair friendly and takes only about 10 minutes to walk. It includes four ecosystems found locally – forest, dune, wetland and fynbos. I’m a fan of bumble bees and was thrilled to discover the pole at the corner of the entrance building, filled with holes made by these bees, at least three species of which are found in the area. Every hole in the wood is made by the female bee, who chews her way into the dead wood – each hole is about 15 cm long! When the burrow is complete, the bee collects pollen and nectar, mixes it into a dry paste and then lays her big egg on to it. She then makes a partition, and repeats the process six or seven times, laying grubs head to tail in her burrow. The grubs eat the partitions and then pupate, emerging as adult bees around the end of January. Getting there: Take the R44 coastal road and follow signs to the Harold Porter Botanical Garden at Betty’s Bay. Open: Weekdays from 08h00 to 16h30 and weekends form 08h00 to 17h00.